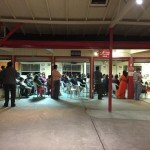 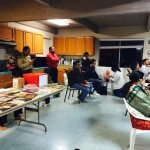 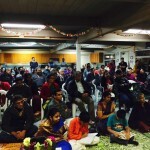 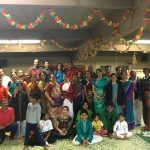 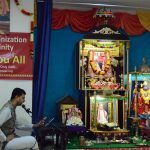 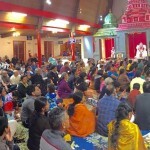 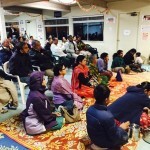 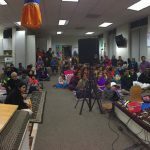 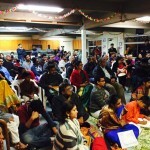 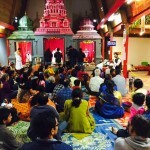 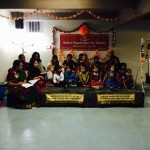 By the immense grace of Sri Swamiji, Bay Area GOD Chapter organized a Bhagavatha Saptham – ‘Govinda Damodara Madhavethi’ led by Sri Ramanujamji from November 14th to 20th 2014 at Sri Siddhi Vinayaka Cultural Center in Fremont, CA. 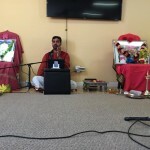 In the mornings, Srimad Bhagavatam tenth canto parayanam was conducted and kirtans were rendered to joyfully commemorate and reminisce the divine plays of Lord Krishna . 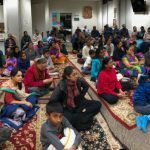 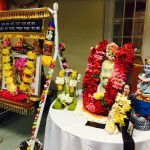 In the evenings, Sri Ramanujamji delivered a seven day lecture series on the divine nectar of ‘Krishna Leela’ and about 100 devotees attended the lectures and listened with awe and reverence. 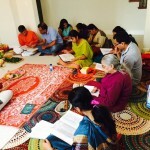 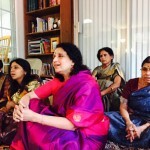 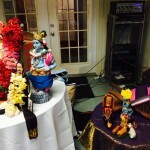 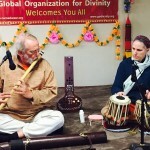 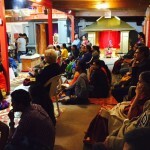 The seven day lectures series began with the greatness of Bhagavatam and Krishna Jananam on the first day. 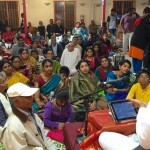 Sri Ramanujamji’s lucid exposition of Puthana Moksham made the audience spell-bound on the second day. 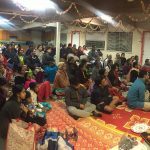 On the third and fourth day the devotees were blessed to hear Damodara Leela, Kaliya Nardhanam, Brahma Mohana leelas of the lord. 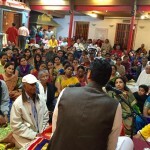 On the fifth day, Sri Ramanujamji enthralled the devotees with Govardhana Leela. 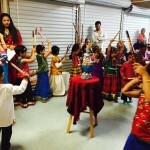 Annakuta Utsav was performed to the lord to commemorate ‘Govardhana Leela’ and everyone joyfully chanted ‘Govinda’. 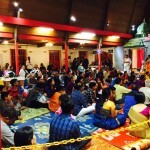 On the fifth day, the devotees were blessed to hear Rasa Leela and the Saptaham concluded with Rukmini Kalyanam on the last day. 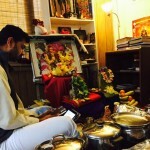 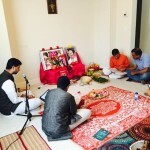 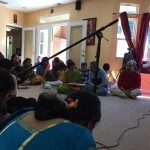 Bhagavata Aarathi and Dolotsovam was performed after the discourse on all days. 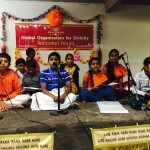 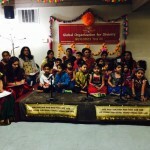 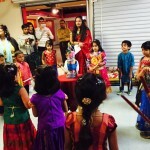 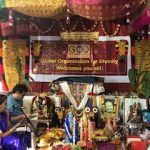 Prior to the discourse series, cultural programs were conducted on all days in the evenings and eminent schools from Bay Area took part in this cultural festival. 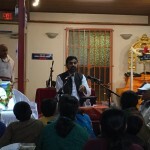 Sri Ramanujamji was also invited by the temple authorities to deliver a special lecture on Saturday, November 15th during the Udayashtamana Seva. 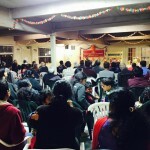 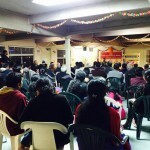 The lecture was attended by over 350 people. 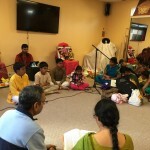 On the last day of the Saptaham, the Gopakuteeram kids enacted a skit, beautifully depicting the greatness of Mahamantra chanting and this was followed by a Mass Prayer session on the last day of the Saptaham. 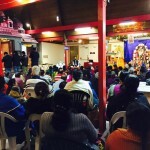 About 100 people took part in Mass Prayer and chanted the divine names with reverence. 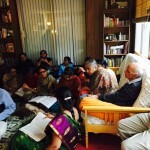 A special Unjal Utsav was conducted on Sunday, November 16th prior to Sri Ramanujamji’s discourse. 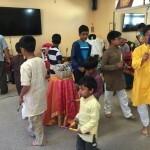 The kids took the divine couple on a Purappadu circumambulating the temple to the singing of kirtans composed by Sri Swamiji and then placed the divine couple on a beautifully decorated Unjal . 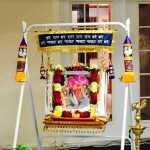 Sri Swamiji’s Anugraha Bashanam was telecasted on the last day of the Saptaham. 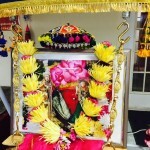 Sri Ramanujamji blessed all the devotees with Kumkum Prasad on the concluding day of the saptaham. 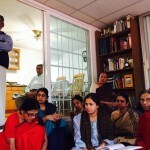 Dinner Prasad was served on all days after the discourse. 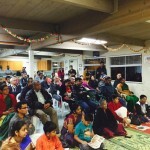 Dinner Prasad was sponsored by local restaurants in Bay Area on all the seven days. 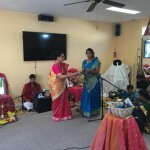 Thanks to Jay Bharath, Ananda Bhavan, Chaat Bhavan, Thali Vegetarian,Tirupati Bhimas and Venkatesh Bhavan restaurants for their generous support to this event by providing dinner Prasad on all the seven days. 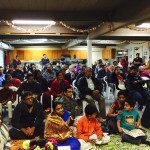 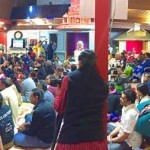 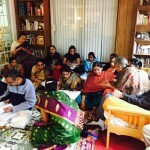 By the immense grace of Sri Swamiji, Bay Area Bhagavatha Saptham led by Sri Ramanujamji went very well.